Situated within the upscale Biltmore neighborhood in Phoenix, AZ, the Camby features a rooftop pool and bar, a 24-hour gym, and a state-of-the-art spa. The Camby is ideal for business trips, getaways with friends, or romantic vacations. With 263 guest rooms and 14 suites, the Camby boasts elegant décor with Southwestern touches, up-to-date amenities, and comfortable bedding. Each room contains soundproof windows and a bathroom with marble countertops. For standard guestrooms, visitors can choose between the Luxe and Mountain Guestrooms. With 350 square feet of space, each room can accommodate up to 4 guests. A king-sized bed or two double beds are available in each. Similar in most ways to the Luxe Guestroom, the Mountain Guestroom offers views of Camelback Mountain. For more space, guests can also book the Uptown Junior Suite or Presidential Suite. The Uptown Junior Suite offers 700 square feet of space. Between the king-sized bed and two optional rollaway beds, this suite accommodates up to 4 guests. It includes 1.5 bathrooms and a separate living area. The Presidential Suite offers 1750 square feet of space. This suite includes a separate living area, a dining room, and a kitchenette. Between the king-sized bed and two optional rollaway beds, this suite accommodates up to 4 guests. It includes 1.5 bathrooms and a whirlpool tub. The Camby also offers pet friendly lodging. The Camby features a slew of dining options for guests to enjoy during their stay. Artizen, Crafted American Kitchen & Bar is a restaurant and bar that highlights local and seasonal cuisine. As the hotel’s signature restaurant, Artizen features a wide variety of fresh and casual options for breakfast, lunch, and dinner. It is also open for brunch on the weekends. Guests can also visit the full-service bar at Artizen. For a unique dining experience, visitors can also attend the Tipsy Tea Party. 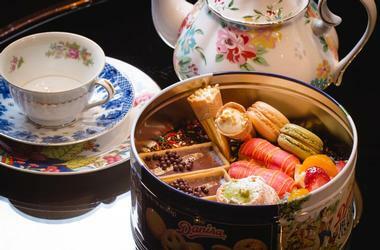 Guests can enjoy sweet treats, savory snacks, and teapots of handcrafted cocktails in this boutique eatery. The Wade Poolside Bar serves the Camby’s pool and sun deck. Guests can enjoy light meals, snacks, and beverages poolside or in one of the rooftop cabanas. The Camby hotel also offers in-room dining throughout the day. For a day of rest and relaxation, guests can head to the Camby’s Zest Spa. Visitors can order a variety of signature massages, body treatments, and facials. Nail services, hair styling, and waxing services are also available at the hotel’s salon. The name itself a nod to Arizona’s appreciation for citrus fruit, the Zest Spa also features citrus-infused treatments that highlight local ingredients. Within the Spa, guests are also welcome to further the tranquility of their visit by taking part in one of the yoga courses, tai chi sessions, or personal fitness classes that are offered. The Camby’s picturesque location and facilities make it ideal for gatherings of any size. Guests looking to book an event at the hotel will have a variety of available spaces from which to choose. Whether looking for a meeting space, classroom, or banquet hall, the hotel offers over 20,000 square feet of indoor and outdoor space for visitors to rent for corporate retreats and weddings alike. 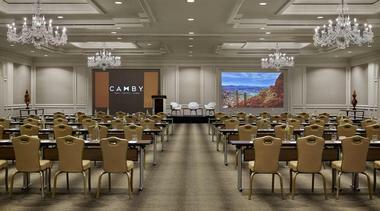 Each facility is outfitted with a variety of technological and audio-visual equipment, and catering from the chefs at the Camby is available for any event. Available facilities include the Camby Ballroom, which can accommodate up to 650 people, and Koko Club, which is typically used for board meetings. Outdoor venues include the Rooftop Bar and the Grove Patio. Couples can also make their wedding-day dreams come true at the Camby. The hotel offers a range of indoor and outdoor venues that are perfect for weddings of any size and aesthetic, including the popular Rooftop Terrace, which offers views of Phoenix and an uncovered gazebo. The hotel supplies multiple wedding packages, rentable décor, culinary services, and ceremony coordination by an on-site wedding planner. 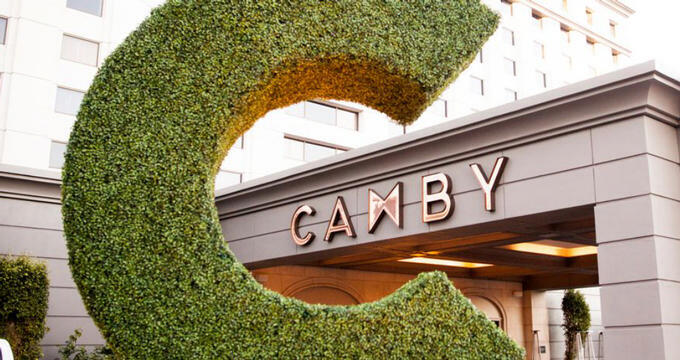 Guests of the Camby Hotel can enjoy shopping, dining, and recreation in downtown Phoenix and Scottsdale. Phoenix is also home to multiple parks, museums, and stadiums. The nearby Camelback Mountain is ideal for hiking and biking, as well as sightseeing. Guests can also enjoy jogging or biking in the city of Phoenix itself. Sports fans may appreciate the hotel’s proximity to Spring Training venues, while golfers can enjoy teeing off at multiple nearby golf clubs.